Picking a theme isn’t just for weddings. In fact, by picking a specific theme for your party, you will not only make the process of planning your party all the more easier but make it look more organized and consistent. Of course, kids won’t really care if all the flowers are roses but sticking to a theme will help with decorating the venue and choosing party accessories. Also, themed parties are way more trendy and interesting than a traditional one. For example, if you use Harry Potter as a theme for your party, you can incorporate DIY floating candles, wizard hats, wands and fairy lights as part of the deco. A party isn’t all about cake and talking. Talking is for adults. Kids, on the other hand, love to run around and play with each other, therefore if you don’t have any activities planned for the kids they will end up chasing each other and making a mess of things. When planning games and activities for a party, it’s important to keep in mind the number of children that will be attending and their ages. As children of different ages have different interests. Activities such as playdough and crafts will be interesting to younger kids. If older children are attending, you can organize games such as a treasure hunt or musical hoops. 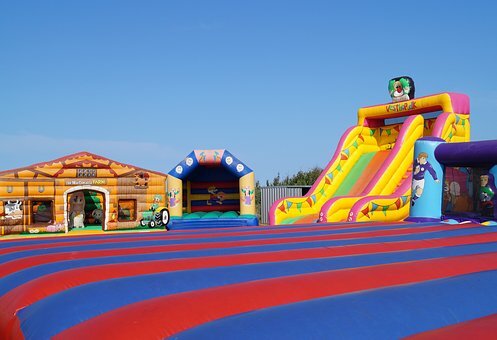 You can also contact a jumping castle hire Sydney to engage the kids if the party is themed outdoors. A pool party is also another great outdoor party idea but would require constant parental observation. Food might be the trickiest of elements to plan in a kid’s party. This is because you have to be aware of any food allergies kids might have. Ingredients like peanut butter is best avoided due to a prevalence of nut allergies among children. You can rent a chocolate fountain for the day and offer marshmallows and fruits for dipping. If you have a party theme, make sure the cake is consistent with the overall theme. Kids also love ice cream cake, so a good old ice cream cake will never go out of style (or taste).